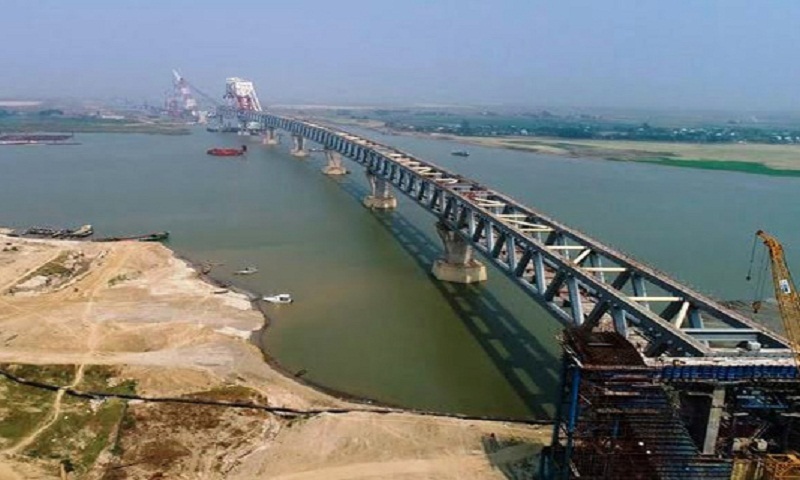 The ninth span of the 6.15-kilometre long Padma Bridge is being installed on 34th and 35th pillar at Jajira end in Shariatpur district today, report BSS. The 150-meter long ninth span will be installed on two pillars at Janjira point at 11:00am today. With the installation of the ninth span at Janjira point, 1,200-meter of the main structure of this mega bridge will become visible, while 150 meters will be visible at Mawa point. A total of 41 spans will be installed on 42 concrete pillars to complete the bridge. The overall progress of Padma Bridge reached to over 63 percent while over 73 percent work of the main bridge has been done so far. According to experts, the national economy is expected to witness 1.2 percent GDP growth rate, while 0.84 percent poverty will be reduced every year after completion of the bridge to be built with an estimated cost of Taka 30,193.39 crore. The first span of the Padma Bridge was installed on September 30, 2017. The second span was installed four months later on January 28, 2018 while the third one was placed on March 11, after one and a half months.